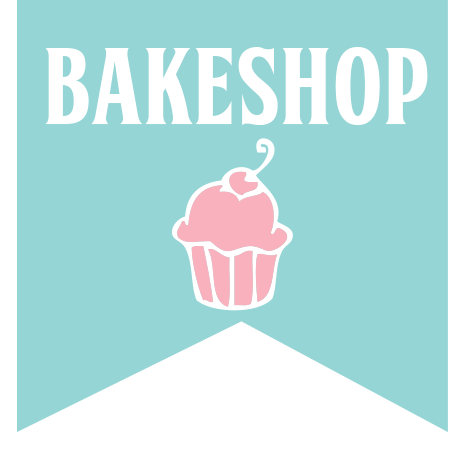 Today on the Bake Shop I will be presenting a bed runner with pockets to store all your e-gadgets, such as iPads, iPhones, Tablets, laptops and Kindles. 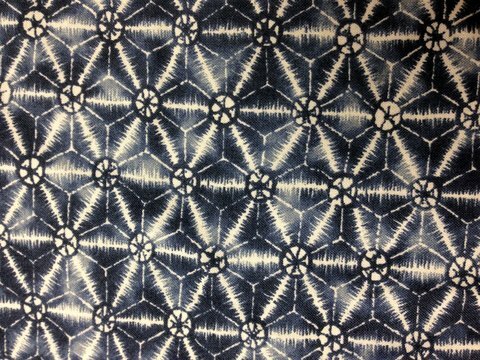 Using the Japanese themed fabrics of Kasuri, I created this very simple runner, based on a print pattern found in the collection. 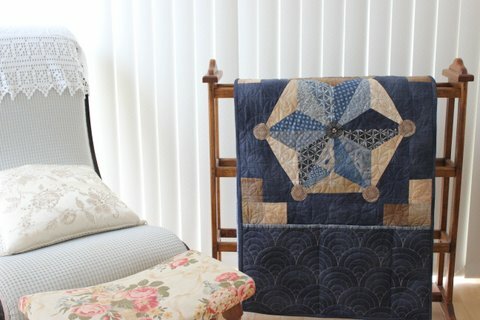 The techniques used in this project are a combination of English Paper Piecing, Applique and piecing. 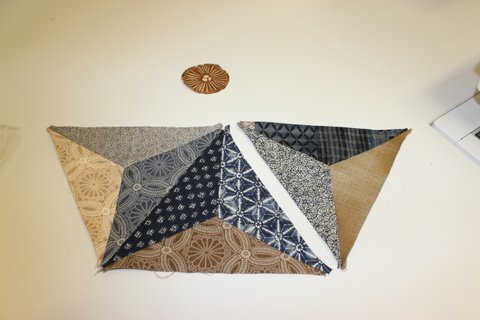 English Paper Piecing (EPP) is a wonderful technique to construct complex pieced blocks or blocks with many ‘Y’ seams. 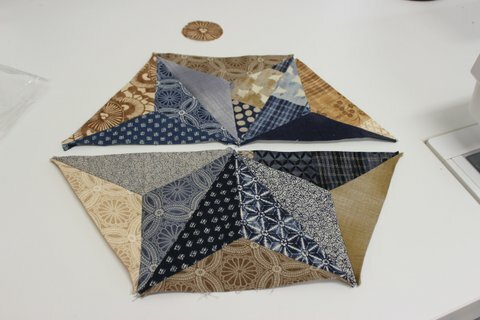 The hand piecing makes it a great “On the Go” project to take anywhere. 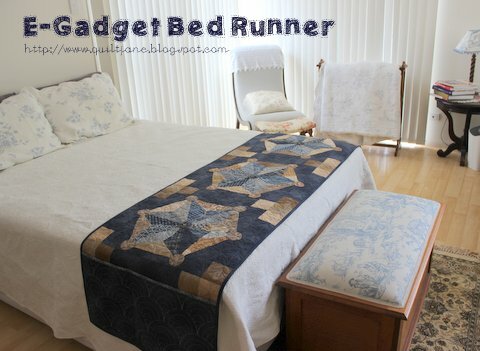 The Runner for this project is designed for a Queen Size bed. 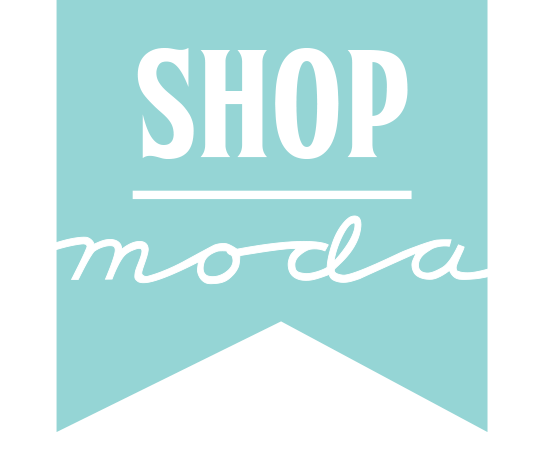 8 – 2 1/2″ x WOF. Set aside 2 strips for the pocket binding. 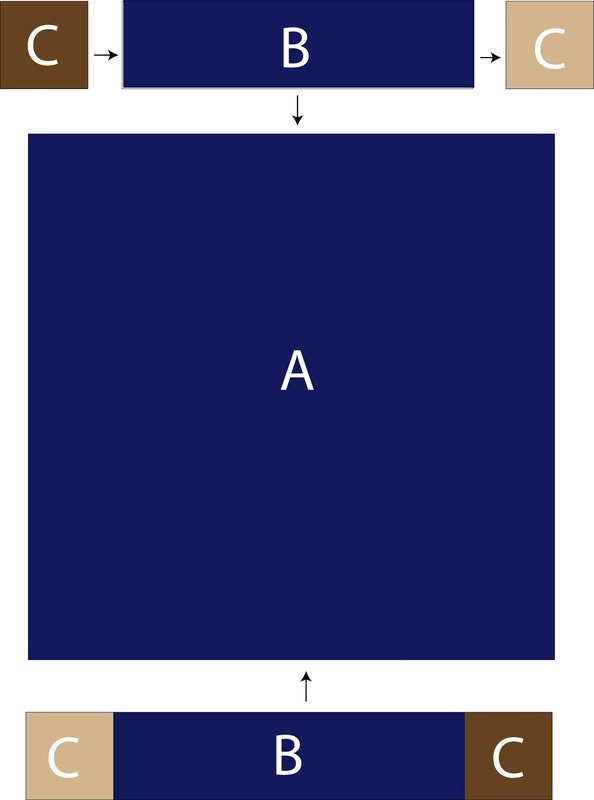 Templates A and B can be found in the PDF version of this pattern within this post. 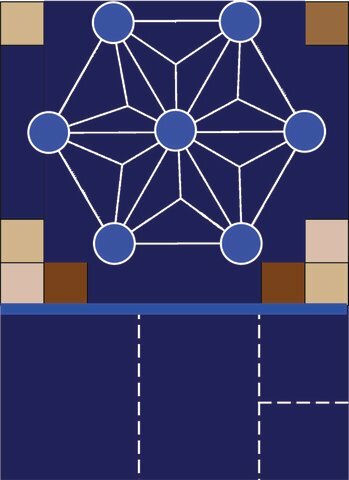 Trace Template A onto your interfacing/paper. Cut out. Make 54. Trace Template A onto the wrong size of the fabric. Cut out piece leaving a 1/4″ seam allowance around each piece. Make 54. 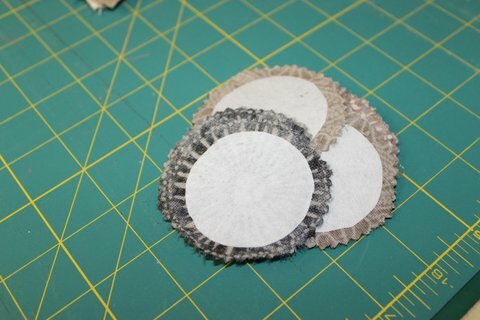 Press seam allowance over interfacing / paper and glue. 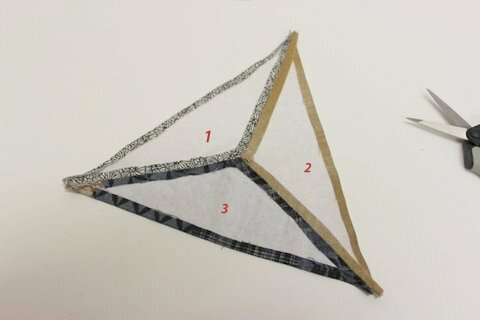 To make each star segment, whipstitch 3 – Piece A right sides together in the following order, 1, 2 and 3. Don’t worry about the little tails at the ends. 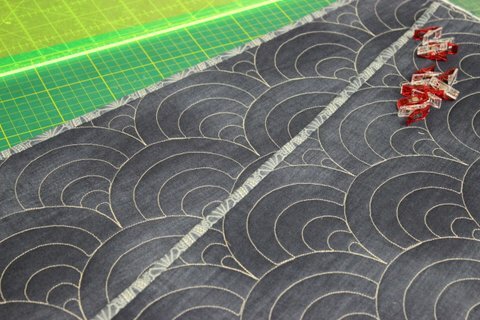 They will be covered by the appliqué circles. small stitches and matching thread. 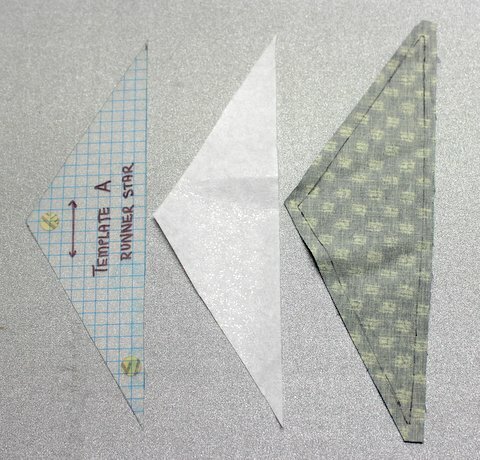 Step 4: Join 3 segments together to form a half star. Repeat. Step 5: Join both halves of the star together. Step 6: Starch and Press. Gently remove papers/interfacing. Step 7: Trace Template B onto the wrong size of the fabric. Cut out piece leaving a 1/4″ seam allowance around each piece. Make 21. 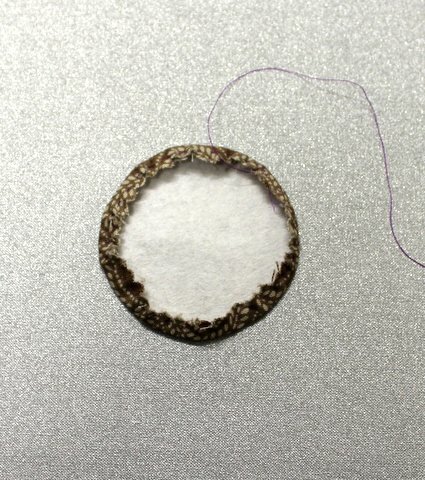 Step 8: Sew a running stitch at edge of fabric circle. 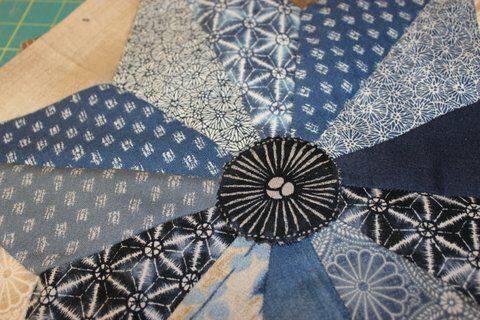 Starch, gather fabric and press. Make sure you smooth out the pleats around the edge of the circle. Step 9: Gently remove papers/interfacing. Step 10: Place a dab of glue on the wrong side of three circles and position one in the centre of each star. Applique in place. Hint: Use glue sparingly. You only need a small drop of applique to hold the piece. 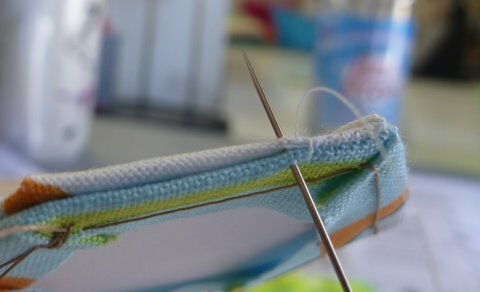 Don’t glue too near to the edges that you are stitching. Step 11: Sew Piece C on each end of Piece B. Repeat 5 more times. Make 6 units. Step 12: Sew units to Piece A. Make 3 finished blocks. Step 13: Fold the finished block in 4 and press to find centre. 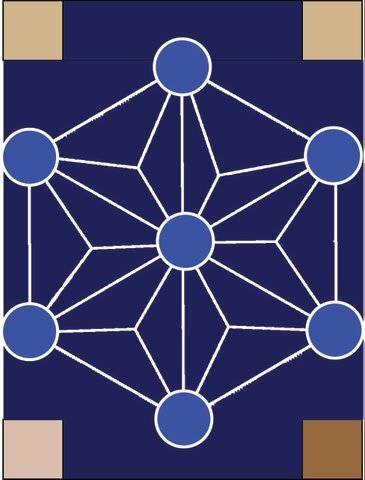 Position the star so the widest measurement from point to point of the hexagon shape is aligned top to bottom. Glue the star to the background block. Applique the star onto the background. Glue 6 circles on points of star and appliqué in place. Position the 4 circles on the edge of the block at least 1/4″ in to allow the adjoining sashing to be sewn to the block. Step 14: Sew 2 C Pieces together. Make 8 units. Step 15: Sew finished units to Piece B. Make 4 finished blocks. Step 16: Sew sashing strips to the background blocks. Step 17: Sew 1 – Piece D to each end of runner. 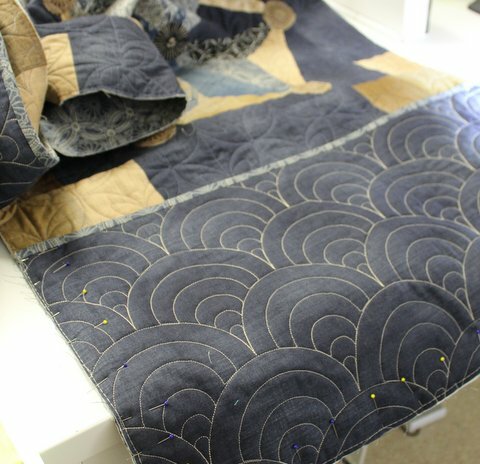 At this stage the runner and pockets are quilted and trimmed. 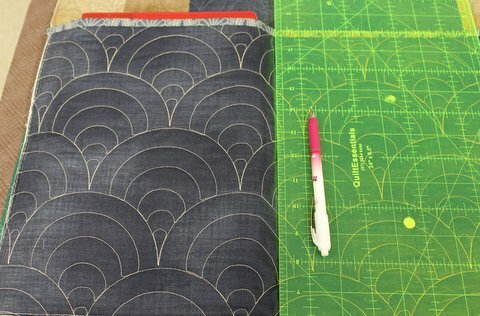 Step 20: Cut 2 – 2 1/2″ x 24″ strips of binding fabric and make a folded binding. Step 21: Sew binding to top of quilted Piece D.
Step 22: Lay Piece D, right side up, on edge of runner and baste 1/8″ around 3 sides leaving the binded edge open. Repeat for other side. Step 23: Determine the width of the e-gadgets that will sit in the pockets. Mark the vertical and horizontal lines on the pocket and sew using a matching thread. I have an iPad and iPhone to add to my pockets. I slipped the devices in the pocket and left a good margin around each and marked with a chalk pencil. For the iphone, I made the pocket divider shorter so I could easily find the phone. The centre pocket will contain a space for my sketch book. in the deep pockets, stitch an horizontal line. Step 24: Bind the raw edges of the runner. Hint: Slow down when sewing through the double layers of the pockets.